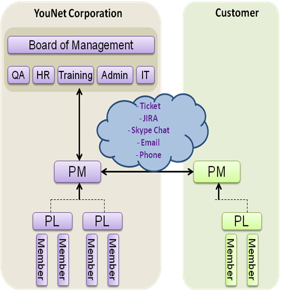 YouNet is a leading niche social network consulting company with more than 120 engineers. We offer full services for Oxwall including Consulting, Plugins, Templates and Customization. With more than 4 years of experience, having completed 400+ social projects, we are the best partner for your success. Q: Please introduce yourself and tell us about your experience in web development. A: Formed in 2008, we are a company dedicated to services on open source platforms for social networks. Over the years, we have developed many useful tools and solutions for social network development projects. We have completed more than 400 projects so far including governmental projects. Q: What level of projects are you ready to tackle for the benefit of Oxwall users? A: We provide full-cycle services starting from consulting, design, development and maintenance. Consulting is very important as it is the first step to build a successful project in terms of cost, schedule, and quality. During consultation, we synthesize our technical experience with our client business concepts to develop a feasible and successful social network. Q: What sort of client-company communication model do you employ? Share the rules and regulations if you have any. A: One of our strengths is the communication process with clients. We use Online Project Management Tracking System (Jira) in which clients can work/communicate with us as a leader of project so that they can monitor all activities/changes of the project with Agile Model. In addition, we also provide chat and phone for further communication when needed. Q: Do you see any particular shortcomings within Oxwall software that need immediate attention? A: The first prominent shortcoming of Oxwall is that it does not provide rich options for Admin configuration, especially for layout customization; For instance, it seems that widget option to drag/drop is not supported in many pages, but only Homepage and Dashboard. The provided layout and functionality also introduce some uncommon designs, such as when users want to embed a YouTube video link in Feeds, they have to copy whole embed code instead of URL only, which may make users confused. Q: Do you have any plans to develop and release purely Open Source products for Oxwall? A: We plan to develop most popular plugins for Oxwall platform by the end of this year. With these plugins, we hope to bring the community a complete productivity suit to further advance their social network to the next level. Q: Are you currently developing your own plugins and templates for Oxwall? What can we expect in the nearest future? A: Yes, we are working on some plugins. We are going to have a dedicated team making templates and plugins for Oxwall as well. That is our commitment in supporting Oxwall community. Check out YouNet store profile and feel free to ask your own questions in comments bellow. We hope to have company representatives answer them. Our good friends at Skalfa announced the launch of professional services for Oxwall. Skalfa is not the first company to offer commercial assistance for Oxwall software, but this offer is unique. It’s a service from the original Oxwall authors, since Oxwall was created as one of Skalfa projects. Also, it’s positioned as “Oxwall for everybody” and claimed to be “affordable for projects with any budget”. All in all, emerging commercial services are a good sign and a valuable addition for the Oxwall project. We encourage other companies to take notice and fulfill the growing demand. Feel free to check what Skalfa has to offer: skalfa.com/launchpad.